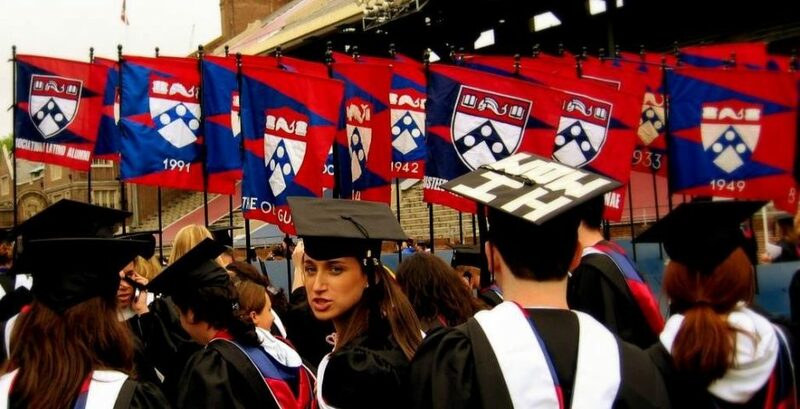 Penn is the most sought-after Ivy among graduate employers, according to new research. 10,000 Ivy League resumes were collected from hiring site Indeed.com to determine whether a specific Ivy degree leads to graduate students getting a job callback or not. Penn graduates who posted their resumes on Indeed.com got 30.6 percent more job callbacks than the average. Yale is close behind UPenn receiving 30.4 percent more job callbacks than average, followed by Columbia with 20.8 percent more, Harvard with 12.3 percent and Cornell with 0.54 percent. On the other side of the spectrum, Princeton had the least amount of callbacks with 48.3 percent less than average, followed by Brown with 26.4 percent less, and Dartmouth with 20.1 percent. Can someone, please, tell me how to go back in time and be a 20yo from an Ivy League school!?!? So I can get an academic job! Indeed.com can’t specify why Penn grads tend to thrive within the job market the most. But it’s important to note that the Wharton School of Business has an excellent reputation worldwide, along with its Annenberg School of Communication. However, don’t go celebrating yet, because callbacks don’t automatically lead to employment. When measuring Ivy League success by actual employment, Penn doesn’t take the lead. Harvard actually beat out Penn for employment rates and post-graduation earnings. And all in all, Ivy League graduates tend to make more than their non-Ivy League friends. Does this mean that you should worry if you weren’t blessed enough to go to an Ivy? Not quite. MIT graduates actually have the highest post-graduation earning out of an other university, both Ivy and non-Ivy. But let’s be honest, MIT is basically an Ivy so are any of us really surprised? Well, don’t start filling out your college transfer forms yet because the majority of CEOs in America’s largest companies don’t have an Ivy League degree or a degree from an equally prestigious university.